As those who read Collies Of The Meadow know I love my collies. They are my life. Albert Payson Terhune is my favorite author. Our collies do everything with our family and the highlight of the year for them is on my birthday they get doggie treats and a small bowl of ice cream (vanilla) to celebrate. Our blog is dedicated to all our collies, past, present and future who have blessed us with their love, enthusiasm for life, their joy and fun and alas their sorrowful ends we somehow sadly live through. I love you my dear collies… I always will. Thank you Mackenzie, Chessie, Niamh, Hallie, Sadie and Anya whom I hope to see again someday. You are my babies and always will be. In heaven I will hug and hold you once again…. To Trevor, Lad, Smoke, Skylight, Mick, Rutherford, Walter, Teddy, Lil Hallie, Branwen, Ellie and Ginger the Shnapp know I love you all dearly. I always will…… you are my life and always will be. Thank you for loving me as I am, a flawed human being whose only hope for salvation is Jesus and my ability to give you love. My other interests are reading, baseball, having penpals. But, my other love in my life after my family and wife is old tractors. I have a old Allis Chalmers b from 1944 that is the Apple of my eye. You can read about her at “My Old Allis” blog here on WordPress. Also, I have a 1941 Allis Chalmers WC who I am currently restoring. Can you tell I like those Orange Tractors? My WC, or Molly as I call her also has her own blog here. “Old Mollys Story” is the tale of a tractor from the tractor’s perspective. I can only second this notion for when I die and I am find no collie to greet me I will know where I am heading for eternity and it will not be heaven. This is Hallie, Anya and Trevor. They were all related to Niamh and these three are the collie who were bred to form Niamh’s Misty Meadow. They are the foundation collies so to speak. One other collie who lives with our friends in Georgia is the other foundation collie and that is Marcus. The descendents of these collies now make up our collie family. These three collies lived here and sadly Hallie and Anya have now passed into the afterlife. Trevor will soon follow. Someday…… I hope they and I will frolic together in the fields of heaven…. till then I can only remember them….and miss them but yet feel their love for me. Many Kennels have descendents from Sunnybank. We are lucky enough to know our lines back to Terhune’s wonderful Sunnybank Collies. 🙂 However, if anyone ever claims their puppies are descendents of Lad or Wolf beware, for Lad and Wolf left no descendents behind. The heroic Lad had Wolf and Wolf who died a horrific yet heroic death left no puppies behinds. 😦 We are hoping for spring puppies… we shall see. Other kennels such as Glendale Farm Collies, Romany Collies, Bella Collies and Widdershins Collies all have the same family lines. 🙂 Good luck in your puppy search! I can certainly understand why you would be interested in a descendant of the Sunnybank collies. But almost every American line of collies is descended from the Sunnybank collies. (99.9% of them) I took the time, and traced my own collies back to Gray Dawn, Thane, King Coal and Bruce. (and just as Albert Payson Terhune often said the “Bruce was the dog without a fault,” so is our Abby girl. I hope you find your collie soon, they really bring so much joy into their families’ lives! Chuck, I saw with interest the photo you posted of George Hawes on horseback with the Southern Sunnyban COllies. It is almost certainly he; and I have sent it to his grand-nephew Jim Hawes for confirmation. My question is, where did you get this photo? I am constantly researching Terhune and when I see something like this, my antennae start vibrating! What beautiful Collies and what a terrific website! Didnt you write a book about Terhune? If so, are there any more available? I have three dogs of my own, and I have considered a collie as my next breed (or a standard poodle, or a Doberman, or a German shepherd…) Gunner, my Texas Blue Lacy earned his CGC, and we are soon to test for therapy certification, Pixie, our Ratty, is on her third agility class (with Gunner) and we are soon to try her paw at fly-ball (she is obsessed), and Paisley, a Doberman mixed mutt, has been through Rally O, agility, and basic obedience. I love them to pieces!!! Perhaps a collie is my next love! We will see! Until then, allow me to drool over your pups! Hi Chuck, Jodi Stone mentioned that she had posted comments to you recently and as she hadn’t heard from you wondered if they have ended up in your spam folder. She asked me to mention it to you. 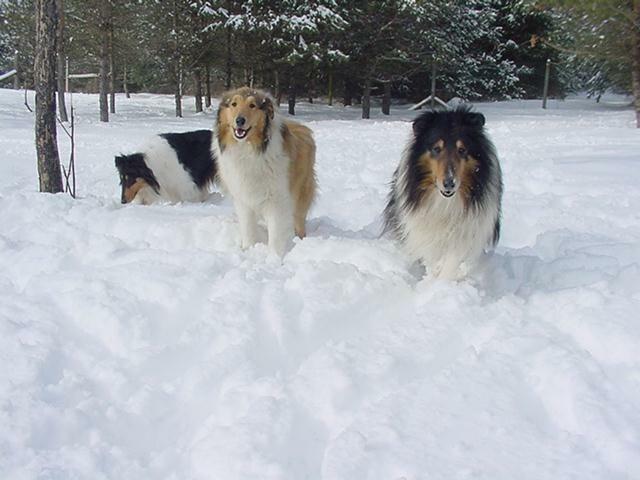 on June 23, 2013 at 12:59 pm | Reply Debra G.
Thank you for writing about and keeping Albert Payson Terhune and his beloved Sunnybank collies alive for us. I found them on a dusty library shelf when I was a young girl living in New Jersey. That time was one of Lassie romping on TV and when I asked for a collie for my 10th birthday everyone thought it was due to the TV show. Unbeknownst to them I was in love with Lad and Lady and Wolf and Grey Dawn and the rest of the Sunnybank collies more I could voice. I didn’t get that bouncing collie puppy but a young rescue from a local shelter. She was my Lady, I named her Lady Victoria, a blond and white collie (or perhaps Sheltie) cross. I loved her with all my heart. Now I am 59 and am looking at my beautiful blue merle collie girl that is also a rescue. Her name is Maeghan which is pearl in ancient Celtic and she too is my heart, sweet and kind and gentle. Just what a collie is supposed to be. Keep up the wonderful stories of your own beautiful brood and also the snips and snapshots of the Sunnybank collies. Thank you for your wonderful comments. As you can see we named a few of our girls with celtic names also! 🙂 We love Sunnybank and Terhune and having found our links back to Sunnybank makes them all the more special. Like you Lassie played a role in my love for collies but Terhune was the one who made me decide I wanted a collie. Lady Victoria sounds like one of those once in a lifetime dogs we have and isnt it amazing how after all these years we still love them as much as we did then, if not more so. Oh, someday we will see them on the other side… what a day that will be! We cheer you for choosing a rescue collie!!! YAY!!! We were in the unusual situation of being able to take in a bunch of the family line our collies belong too when their families no longer could afford them or keep them. Our friend Teresa took them in first and then we adopted them and gave them all a loving home. God Bless You and thank you for commenting! Beautiful dogs! Your passion and love for them really shows! I have a friend who has Blue Merle collies! Known quite a few friends with them. Wonderful dogs! Keep up the great work! Love your Collies! I heard about this fun photo campaign and thought you may be interested in sharing photos of your dogs. Can you email me when you get a chance? Wow! Thank you for your kind compliments. Nice to hear from you. 🙂 God Bless You! I do want to let you know that Smokey died last fall from a quick, short illness. He passed in his sleep lying next to Darcy knowing he was deeply loved. I bured him next to Trevor for he loved Trevor…. So, our oldest is now Laddie whom we bought from you along with Skylight who will be 10 next year and then Ellie and Branwen are the next in age and will be 9 yrs of age.